Ethereal illustrations and fun rhyme schemes make this a dreamy bedtime tale. A dreamy bedtime story*, Rocket-Bye* is a fun rhyming picture book with ethereal illustrations to engage young children. The story takes two siblings on a rocket ship ride, past the moon, planets, and constellations. Included in this calm fable are tidbits of space facts, such as “Mars’s red glow” and the rings of Saturn, making this sweet bedtime adventure book also educational. Author Carole P. Roman is the author of the Captain No Beard series, and her work expertly combines sweet and simple rhyming with educational facts, creating the ‘song’ of a classic bedtime tale. Words and phrases are evocative, as with “We bounce; we coast; we loop-de-loop.” Roman excels at setting the mood early in the story as she writes of soaring, wave riding, clear air, and not being afraid. Illustrator Mateya Arkova, from Bulgaria, creates soft, misty digital images for this story. The style perfectly fits the sleepy mood of both the space setting and the bedtime story aspect of the book. The colors are mostly toned down for this night story, except for certain pops here or there when called for, such as a brighter red for Mars. There are stars sprinkled throughout the pages, and even cute extras, such as the flying saucer on one page or the alien sitting on a planet on another, that bring some additional fun. There are times when a little more definition could make certain things, such as the children, pop more out of the soft focus images, though. The internal font is kid friendly, but very clear. The lines also vary, laid out in gentle waves on some pages, and standard straight on others, excelling at keeping it visually interesting and fun, while also allowing the eyes to rest and read normally. 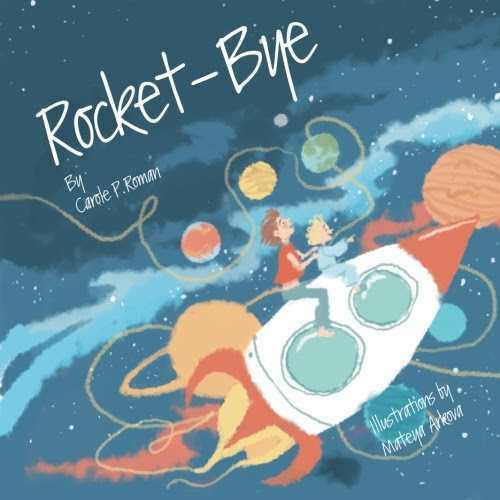 Children from toddler age to mid-grade school age are sure to enjoy this calming, quiet bedtime story and will dream of the outer space adventures of Rocket-Bye.